The dispute between Amazon and the publishers is a dispute between an e-commerce giant and companies that have for generations been printing text on paper. A dispute between hyper-capitalism and cultural conservation. A dispute that comes down to different visions of the future of the written word. Porque não há respostas simples, regressemos às vendas do papel. A deixa é a mais recente multa da UE ao Google pelo aproveitamento que faz da sua posição de monopólio para secar a concorrência à volta. Business as usual entre os gigantes tech, e hoje abrimos um novo capítulo que já tardava -pelo óbvio da relação às teses: papel, digital, imprensa, livros, $$$ - e julgamos prudente introduzir nesta fase: Amazon. Nota: sorry folks, long text de introdução muito generosa a pecar pelo excesso de cites para arquivo e uso futuro. Tentaremos manter cliffhangers em pontos-chave para conseguires chegar ao fim, we-good? Outra nota: vamos alternar entre anos muito diferentes ao longo do texto, queres ficar sempre de olho nas datas em rodapé. Das vendas de livros, da evolução destes para o digital, de ebooks e eReaders, de outros aparelhos como o telemóvel e como estes mudam hábitos de leitura e formatos... Alguns começam a levar o entusiasmo longe demais a propósito do bom momento de vendas de livros impressos - e"hora de crashar a festa" é nome do meio dOS POSITIVOS. Começamos pelos entusiastas mais voluntariosos, mais recentes, e que nos fazem o favor de meter os media ao barulho para comparações. The rise of print book sales and decline in ebooks in 2015 was no accident. Last year, the trend continued, and self-publishing in electronic form no longer seemed as good a bet as in previous years. The popularity of both formats has been steady since 2014, thanks to older consumers who refuse to leave print behind and younger consumers who seek a more analog lifestyle. Na peça o autor apresenta as razões da moda que invariavelmente podemos resumir ao saudosismo do analógico - e se no original não encontramos referências ao regresso do vinil, essa será talvez a única originalidade do artigo. E aqui o entusiasmo confunde-se ao voluntarioso com algumas afirmações que nos fazem soar o alerta. Como o autor a olhar de desdém aos que entraram numa corrida ao zero digital - pun intented! If traditional book publishers accepted that the digital revolution meant a total overhaul of their business - the way the music and media industries have largely done - they would be locked in the same race to the bottom that those two industries have faced. The ease of digital self-publishing and readers' sense that digital books should be cheaper than paper ones have resulted in growing unit sales but falling revenues. Ainda que não muito mais tarde falhe em reconhecer essa mesma estratégia nas "boas" soluções que as editoras adoptaram para promover o papel. Book publishers have kept their paper-based operations and helped their physical distribution networks to stay alive by charging low wholesale prices. E não será a única incongruência no favoritismo devido ao papel em detrimento do digital que lhe escapa. No enlace de uma crítica mais generalista aos ebooks -veremos abaixo-, acaba por defender modelos de negócio que os mesmos censuram às lojas online -again, a ver adiante. [Book publishers] have also maintained a time gap between the paper and digital releases of important books. The printed book ecosystem survived the tech revolution, and it no longer appears to be in danger from it. Much of the news business fell victim to the tech hype that it helped create. After all, self-published authors haven't killed off Random House and other big industry players, and bloggers and free websites wouldn't have killed old media companies. Publishers just needed to more persistent and inventive about selling them. Of course, the news media had an advertising revenue dependence that cheaper digital ads couldn't feed. Book publishers didn't have that problem. But it's the media's own fault for not trusting readers to pay for good content. Now, the best of them are correcting this mistake. And, amazingly, some media outlets did hold out. Uma delícia a desgostar outro dia: a elite e os amadores, o self-publish e os big industry players, o velho e o novo, o free e o $$$, embrulhados aos media, ads e mais $$$... Agora, o crash. Igualmente de uma peça deste ano, o debunk dos bons números das vendas do papel impresso. Hipótese: podemos acreditar neles? Podemos, mas são terrivelmente insuficientes. It pays to go deeper. Mainstream media has long been in the habit of relying on figures from publishers' associations, retailers' groups and Nielsen data, but the industry has changed. While these measures are accurate, they are only accurate in terms of what they measure, and they represent far less of the industry than they once did. They are no longer a proxy for the industry. The publishing industry has changed. It is no longer solely the domain of members of publishers' associations and books with ISBNs that allow easy tracking and accumulation of data that appears robust but tells much less of the story than it once did. While the Association of American Publishers' figures are based on a survey of 1,200 publishers and often seen as authoritative, the Amazon Kindle Store stocks many independently published titles and titles published by small and micro publishers not captured by the survey. At the same time as the association was reporting a drop in overall eBook sales, Amazon, the retailer with the majority of the US eBook market, reported increases in sales in terms of both units and revenue. And other avenues were opening up in eReading that was not feeding into the statistics: while subscriber downloads earned an author readers and, in the case of subscription libraries, revenue, they did not count towards sales. Publishing had split into two markets, with a widening gap between them. Self-published and micro-published authors, particularly those writing genre fiction, were pricing their eBooks much lower and claiming an increasing share of the market, particularly through Amazon, while large publishers were increasing eBook prices in a way that reduced eBook sales. Longa história resumida, afinal há uma razão menos prosaica para a quebra das vendas em digital e o aumento do livro em papel. Não estão a contabilizar o grosso das vendas de ebooks porque estas ocorrem fora do circuito das editoras tradicionais. As editoras tradicionais estão a sabotar as suas próprias vendas digitais. E é nesta última alínea que tudo se torna interessante e a nossa história realmente começa. Those figures, though, do not tell the whole story. Following the renegotiation of pricing between major American publishers and Amazon, eBook prices rose in the US Kindle Store in late 2014 and 2015. Until then, Amazon had pushed publishers to keep prices no greater than $9.99, and buyers had become conditioned to paying less than $10 for eBooks. Publishers that increased prices above that mark subsequently recorded a fall in eBook receipts, and some identified higher prices as a factor. E-book sales have fallen but print is enjoying a resurgence. The primary reason for this is due to Amazon not being able to set the digital price anymore, the publishers are doing that. This has led to an average increase of $5.00 per title and many people find that paying $15.00 for a Kindle book, is too expensive. E é aqui que a nossa história tem o seu primeiro twist: o conflicto entre editoras e distribuidora. Publishers are selling more print, which they wanted. There’s growth in the indie store base, which publishers also wanted. But Amazon continues to grow market share and now opened a handful of physical bookstores. And that is most definitely not what publishers wanted. It’s good news and bad news for the publishing industry. In short, the publishers’ push towards paper is working but for all the wrong reasons. Revenue is down in ebooks because Amazon, using their mercantile might, has been aggressively selling paperbacks and hardbacks after publishers took away their power to control ebook pricing. Now ebook prices are way up and print prices are way down, a situation that eats into the publishers’ physical distribution models and guts their ebook sales. Amazon, for its part, began attacking hardback pricing a few dollars above ebooks prices. One book came out last year with a "$12.70 Kindle edition paired with a $13.37 hardcover" on release day, a move that made little sense in the old way of doing business. In fact, publishers usually drove up release-day pricing to stratospheric levels thereby grabbing a nice boost as hot titles flew off the shelves. But because Amazon buys books wholesale it can price things however it wants without regard to the publishers wishes and because Amazon sells so many books nothing they can do or say can sway the ecommerce behemoth. A crispação entre ambos vem de trás -lá chegaremos- e é difícil encontrar um herói ou um vilão nesta história: ambos são igualmente repreensíveis, mas a imagem da Amazon como benefeitora de uma humanidade iluminada pelo acesso universal a toda a literatura que se possa desejar é agora questionada por qualquer um que se debruce no tópico - e não apenas por livreiro queimado. Amazon’s drive for cheaper prices has been good for consumers, and arguably for literary culture, too. When books are cheaper and more widely accessible, more people can read them — and there’s nothing better for literary culture than people owning and reading books. Physical bookstores sell books at a huge markup, which necessarily reduces the number of books that people can afford to buy. Amazon sells printed books, e-books and audiobooks for much, much less. [Mas] wait till Amazon controls the whole market — then see how well it treats authors, publishers and customers. So far, Amazon has marketed itself as a book buyer’s best friend. It sells books at terrifically low prices, it delivers them amazingly quickly, and it constantly invents new technologies to improve the way we read. Amazon has also invested heavily in publishing new authors and it has pushed exciting new formats made possible by electronic distribution. 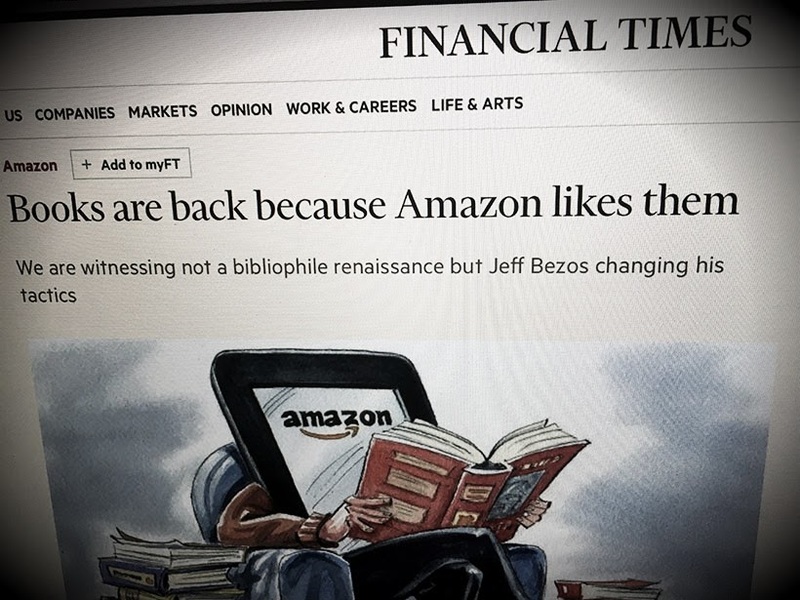 Yet the literary community has always greeted Amazon’s moves with suspicion. The fear is mostly about the future. What will happen to books when Amazon controls the entire industry? How will authors and publishing houses reckon with Amazon’s unchecked power? The company’s willingness to nakedly flex its anticompetitive muscle gives new cause for concern to anyone who cares about books. To exert pressure on Hachette, Amazon began taking down preorder buttons for many Hachette titles. It has also suddenly raised prices on some Hachette books and has changed its page design to more prominently recommend other titles. These moves follow weeks of increasingly hardball tactics. Among other customer-punishing moves, Amazon has increased shipping times for Hachette titles from a few days to weeks. As part of a contract dispute with the publisher Hachette, we’re seeing Amazon behaving at its worst. A battle over pricing may have been the Sarajevo moment. But the war is really about the future of publishing—and maybe of culture. When Amazon first appeared, in the mid-90s, mailing books out of the Seattle garage of its founder, Jeff Bezos, it was greeted with enthusiasm. The company seemed like a useful counterweight to the big bookstore chains (Borders and Barnes & Noble) that had come to dominate the book-retailing landscape. The big chains were good for publishers because they sold so many books, but they were bad for publishers because they used their market power to dictate tough terms and also because they sometimes returned a lot of stock. People also worried about the power of the chains to determine whether a book did well or badly. [Enter Amazon a fazer o bypass das grandes cadeias:] As long as you had a credit card, and the postal service could reach you, you suddenly had the world’s largest bookstore at your fingertips. As the company sold more books, it sent book publishers more money. What was there not to like? publishers agreed to digitize a worthwhile selection of their books [but] none of the publishers spent much time thinking about how much e-books should cost. When, finally, at the press launch of the Kindle, Bezos announced that new releases and best-sellers would be priced at $9.99, the publishers had a fit: they had no control over the price. The publishers wanted to sell e-books, and they wanted to sell them when people were most likely to buy—when a book was new. But they also wanted to set the price. What was the problem with $9.99? The heart of the matter was that it was so much less than $28, the average price of a new hardcover book. Another problem with $9.99 was just how close it was to $7.99 or $6.99. Publishers believed that Amazon would eventually go even lower, putting intolerable price pressure on print books and the places that sold them. With print gone, what exactly would publishers be left with? They could still select and edit and market books, but their chief task, getting the books into stores across the land, would be eliminated. In January 2010, as publishers were becoming increasingly desperate over Amazon’s growing dominance of the e-book market, Apple announced its plans to launch the iPad and include access to an iBooks Store. This time, publishers were going to do e-books right. Instead of letting Apple set prices, they’d set their own prices and let Apple take a 30 percent commission. It would mean less money than they were getting from Amazon, but the peace of mind would be worth it. In early 2010, the Big Six publishers (Hachette, HarperCollins, Macmillan, Penguin, and Simon & Schuster, but not Random House) signed agency agreements with Apple for the iBooks Store. In April 2010 the iPad made its debut to tremendous critical and commercial acclaim. Before too long, Apple claimed a 20 percent share of the e-book market, and publishers, happily, were able to set their prices—usually from $12.99 to $14.99. Now someone had to tell Amazon that the publishers intended to switch to the same model with Amazon as well. The first to try was Macmillan. Amazon removed the "buy" button from all Macmillan titles. Oops. Segue-se a Hachette, outra das gigantes mundiais, e linhas vermelhas são riscadas no chão. In early 2014, Hachette reached a deadlock in negotiations over a new contract with Amazon: Amazon decided to take a hard line in order to nip this kind of behavior in the bud. Basically, Amazon was putting in place a blockade against Hachette. The Amazon war of 2014 had begun. The world where Amazon is the only gatekeeper would be a deeply problematic one. In Amazon’s mission to remove all barriers between readers and writers, the biggest obstacle is the New York publishers. On one side is a publisher whose roots stretch back to 1837. On the other is a technology company that has single-handedly upended just about every part of the relationship between readers and their books. Amazon wants to do away with gatekeepers. It promises a world where books are cheap, where anyone can publish anything, where there are no editors or distributors saying this is not what is selling now, go away. Amazon controls the Kindle e-reader platform and sees no reason a publisher like Hachette should receive so much of the revenue from a digital book. That was where the negotiations failed. Hachette is holding fast to the traditional publishing system that underpins modern culture. It was a world where publishers bankrolled writers in return for a large cut of the proceeds, where editors improved prose and sharpened arguments, and where books were selected and presented rather than simply released. They cost more, too. Hachette said any resolution would have to "value appropriately" the publisher’s role in editing, marketing and distributing books. E uma para a possibilidade da Amazon ser afinal um evil doer mais maléfico que as grandes corporações editoriais. The retailer has had great success in reworking the publishing industry, partly because it has focused so relentlessly on customers that they always knew they were getting a better deal. It also paid higher royalty rates on e-books it published itself than the traditional publishers did on their e-books. But even those who believed Amazon was ushering in a utopia of publishing were jolted a (...) when it abruptly chopped the royalty rates on self-published audiobooks. "I’m shocked that Amazon would do anything to fuel the speculation that once they grow big enough, authors will suffer" wrote an author who is usually a champion of Amazon’s way of doing things. Hachette won an important victory on Thursday in its battle with Amazon: the ability to set its own prices for e-books, which it sees as critical to its survival. E seguiu-se o festejar. Seguimos com outra peça-marco do NYT: all is well now! "The e-book terror has kind of subsided," he said. Five years ago, the book world was seized by collective panic over the uncertain future of print. Print sales dwindled, bookstores struggled to stay open, and publishers and authors feared that cheaper e-books would cannibalize their business. Then in 2011, the industry’s fears were realized when Borders declared bankruptcy. "E-books were this rocket ship going straight up, just about everybody you talked to thought we were going the way of digital music." But the digital apocalypse never arrived, by 2015, digital sales have instead slowed sharply. Now, there are signs that some e-book adopters are returning to print, or becoming hybrid readers, who juggle devices and paper. E-books’ declining popularity may signal that publishing, while not immune to technological upheaval, will weather the tidal wave of digital technology better than other forms of media, like music and television. Sales of dedicated e-reading devices have plunged as consumers migrated to tablets and smartphones. And according to some surveys, young readers who are digital natives still prefer reading on paper. The surprising resilience of print has provided a lift to many booksellers. Independent bookstores, which were battered by the recession and competition from Amazon, are showing strong signs of resurgence. "It’s resulted in a far healthier independent bookstore market today than we have had in a long time." Independent booksellers agree that they are witnessing a reverse migration to print. "We’ve seen people coming back, they were reading more on their Kindle and now they’re not, or they’re reading both ways." Then, three-quarters of the way through the lengthy piece, the real economics of the publishing industry appear. The main difference, from the publishers’ point of view, between print books and e-books is that it’s very difficult to self-publish a print book: it’s difficult for an author to distribute physical books to thousands of real-world bookstores. In a world where books are mostly delivered electronically, it’s hard to imagine that publishers will play much of a role. E os menos distraídos começam a pensar que a Amazon perdeu a batalha mas não a guerra. There’s no question publishers’ net receipts have gone down. The e-book woes of big publishers appear to be dragging down sales figures industrywide. Publishers said the current pricing model involves some sacrifice but they felt it was worth it to keep Amazon in check. When the world’s largest publishers struck e-book distribution deals with Amazon (...) they seemingly got what they wanted: the right to set the prices of their titles and avoid the steep discounts the online retail giant often applies. But in the early going, that strategy doesn’t appear to be paying off. Pricing e-books is a Goldilocks problem for the book giants: for years they worried that consumer prices were too low, and now they are seeing the disadvantages of bumped-up prices. Amazon surprised many pundits over the past year as they signed deal after deal that gave publishers control over ebook prices, but now I think we know why: while the ebook prices were consistent, Amazon's prices for paper books were shockingly low. "Amazon is leaving the ebook prices—set by the publisher—alone…and messing with the paper prices". Amazon has accepted that it can't win the ebook fight with the major publishers and has instead turned to fighting a price war by aggressively discounting the print editions. Basically, if Amazon can't get the publishers to offer what Amazon sees as reasonable ebook prices, the retailer has decided to make sure that no one is going to buy those expensive ebooks. If anyone thinks this is over, they are deluding themselves. Amazon covets market share the way Napoleon coveted territory. Hachette got Amazon to allow them to control pricing while also cutting the amount of money Amazon takes if the publisher does engage in discounts, which appears like a victory. But in the end this all cements Amazon’s ultimate long-term role in this business, which will only put Hachette right back in this situation every time they are up for renegotiation. Amazon feels publishers get too much of the revenue from e-books [and] the big New York "are no doubt going to continue to price e-books as high as they can to protect their paper sales." Poder-se-ia imaginar que a Amazon a vender mais livros em papel em detrimento do ebook seria uma win-win situation para as editoras que receam pelo seu lugar num mundo plenamente digital, mas a Amazon possui uma dimensão que a torna infinitamente mais influente que as Borders ou B&N do passado, os senhores de então que ditavam o seu sucesso ou sobrevivência. Google, Facebook, Apple, Microsoft, Amazon são gigantes a uma escala que nunca se conheceu antes e geram uma economia de escala que lhes permite ditar as regras do mercado: são, de facto, monopólios. Como o é a Amazon, a única que ainda tem concorrência na forma de modelos herdados do passado e que activamente os desmantela. Só nos livros, ela já a mais bem sucedida distribuidora no planeta, editora de sucesso e a expandir-se em lojas físicas: o circuito completo do autor ao leitor sem mais intermediários. As editoras têm muito que se preocupar, e a estratégia de desbarato dos livros tem um efeito perverso sobre estas: além de habituarem os compradores a outros preços, sobretudo destroem no processo as lojas independentes que tentam favorecer para contrabalançar a sua dependência à Amazon. Sem estas, a Amazon assume-se senhora de toda a distribuição de cujas condições as editoras não se poderiam escusar mais. Was this a digital hiccup, or a final reminder by Amazon of its power? Amazon has been cast as a bully in publications across the ideological spectrum, and a large group of authors is calling for it to be investigated on antitrust grounds. Amazon’s supporters publicly questioned the need for Hachette, the fourth largest publisher, to exist in an era when authors can publish themselves digitally. Depending on where you stood, it was a struggle between the future and the past, culture and commerce, the masses and the elite, technologists and traditionalists, predator and prey. Uma luta que a história diz-nos estar a ser ganha pela Amazon. Hoje mesmo a O'reilly -editora técnica na área do todas-as-coisas-digitais com mais know-how no seu mindinho que as restantes editoras deste planeta e cujos livros mais que provavelmente foram leitura essencial à engenharia que suporta as novas techs- fez as contas e decidiu fechar a sua própria loja online -das mais antigas, bem sucedidas, e dirigidas a um público especializado com competências no seu uso- para depender da Amazon (e "outras" indiscriminadas...), pelas facilidades que estas ainda assim superam. Um canto de cisne paradigmático. This week, O’Reilly Media stopped retailing books directly on our ecommerce store. We still sell them through Amazon or your favorite retailer. It's clear that we're in the midst of a fundamental shift in how people get and use their content. Rather than innovate and serve their customers, publishers have been resisting technology. They could have invented their own Internet bookstores, their own e-readers, their own self-publishing platforms. Instead, fearing the future, they fought to protect the status quo. The Amazon-Hachette dispute mirrors the wider culture wars that have been playing out in America since at least the 1960s. On the one side, super-wealthy elites employing populist rhetoric and mobilizing non-elites; on the other side, slightly less wealthy elites struggling to explain why their way of life is worth preserving. Next dos monopólios da Amazon: leitores, e, sobretudo, autores. As publishers game out e-book pricing, the stakes are high for ­authors and agents. "I want my clients’ books to be sold for as high a value as possible, but the important word is sold."